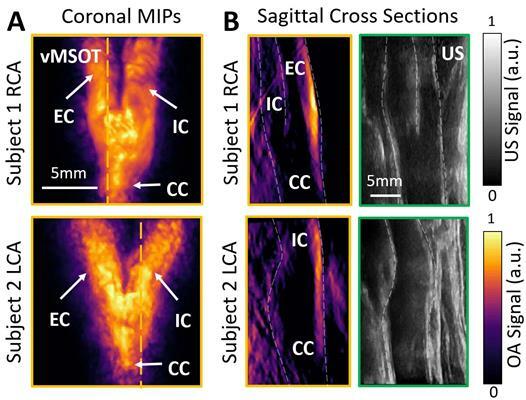 February 12, 2019 -- A new imaging technique known as volumetric multispectral optoacoustic tomography (vMSOT) provided better visualization of the carotid arteries than ultrasound did in a new study, published online February 12 in Radiology. It may help advance the noninvasive assessment of cardiovascular disease, according to the researchers. Plaque buildup in the carotid arteries is one of the main risk factors of ischemic stroke, and clinicians most often rely on ultrasound, MRI, or CT to identify it. A major limitation with these standard imaging modalities is that they are inadequate at revealing the makeup of the plaque. This is crucial since a plaque's likelihood of rupturing and causing a stroke is strongly associated with its composition, noted senior author Daniel Razansky, PhD, from the University of Zurich and colleagues. Early identification and treatment of plaques susceptible to rupture could help reduce an individual's risk of cardiovascular disease. To improve upon carotid artery plaque assessment, the researchers turned to the relatively new imaging modality vMSOT, using a handheld scanner that employs spectroscopy to display tissue at a molecular scale. By moving a vMSOT device along an individual's neck, clinicians are able to determine noninvasively the makeup of arterial plaques -- including lipids, melanin, and other biomarkers -- ultimately helping them estimate the risk of plaque rupture. Images of the carotid artery bifurcation in two different patients using vMOT (A and B, orange boxes) and B-mode ultrasound (B, green boxes). Image courtesy of RSNA. "Rapid characterization of tissue function and molecular composition is limited with [standard imaging] modalities, which commonly results in poor diagnostic accuracy and ineffective treatments," Razansky said in a statement. "Unlike most other clinical imaging modalities mainly looking at late-stage anatomical manifestations of diseases, vMSOT is capable of sensing specific molecules in tissues without administration of contrast agents." To test the technique, the group acquired vMSOT images of 16 individuals who previously underwent conventional ultrasound exams. The vMSOT device provided an effective field-of-view of approximately 2 cm3 with the potential for depth adjustment to as much as 30 mm, all in real-time. Images captured with the device also showed considerably fewer motion and blurring artifacts than are typically visible on ultrasound scans, according to the researchers. A key advantage of vMSOT is that it can visualize the carotid artery, internal carotid artery, and external carotid artery in a single volumetric image frame -- allowing for 3D volume rendering with a single shot without the need for probe scanning, according to the authors. In contrast, obtaining a full view of the carotids with ultrasound requires a lengthy acquisition time and the need to alternate between various 2D cross-sectional views. "In the case of carotid artery disease, assessment of the entire bifurcation area in real-time and in 3D is only possible with vMSOT," Razansky said. "It also has the additional potential for label-free identification and assessment of clinically relevant biomarkers of carotid artery disease, which helps with early and accurate diagnosis, timely treatment planning, and monitoring." For future studies, the group has proposed combining vMSOT with ultrasound for an even more comprehensive characterization of the carotid artery. "Given its fast imaging performance, excellent molecular contrast, portability and affordability, I truly believe that vMSOT will soon be routinely used in the clinic," he said. "One day, it may even become as popular as ultrasound."